Celaena Sardothien is notorious for being the youngest and deadlist assassin in Adarlan. Her days of killing came to an end when she was caught and imprisoned in the salt mines, but to her shock, she's being given a second chance. If she becomes the prince's champion in a competition that the king is holding for a new Crown Assassin, she just might win her freedom. Celaena is cocky and certain she'll win. But the king's court is a dangerous place to live, and someone is slowly picking off her competitors. Celaena must be very careful, for the most obvious threats are not the deadliest. 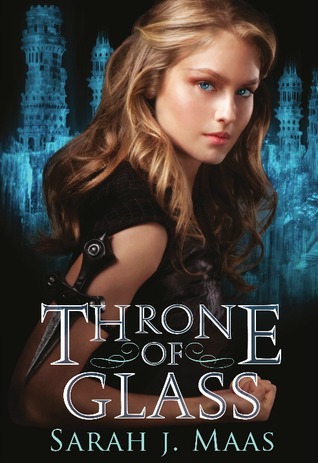 Throne of Glass is a breathtaking debut. You can't help but fall head over heels in love with protagonist Celaena. Part of her appeal to readers is the tremendous amount of power she wields so effortlessly. She's an incredibly strong and clever heroine, and action follows her everywhere, but she's not without her vulnerabilities. She has a shrouded past that relentlessly haunts her, and she has the capacity to be very vain and a bit childish at times. However, like Buffy Somers, she is full of power and humor and is charming despite, or perhaps because of, her shortcomings. The plot never lags in between the competition, murders, forging of friendships, making of enemies, romantic interests, and unexpected character twists. Maas does a great job at balancing it all while slowly hinting at Celaena's past, and the romantic tension in the novel is nice and not overdone. There is definitely room for romance and the two male leads will have fans picking sides, but the first book focuses more on Celaena's personal struggles than her love life. This action-packed read with a gutsy heroine in the middle of a highly developed fantasy world is engrossing and exciting—do not miss Throne of Glass! Cover Comments: I am loving the fierce expression on the girl's face, the blue background, and that dagger! Awesome! I actually thought there was a little too much about the romance and Celeana's struggle with her feelings toward the guys-since I was very anti-the love triangle this really stood out to me. It will be interesting to see how it develops. I think my favorite part of the cover is the blue background!! But I'm not sure if I would like this book, I've heard there is a triangle and that kind of drives me nuts. I absolutely loved this book, I was scared to read it because of all the hype around it, but it was just so full of awesomeness! I loved all the action and how Sarah just got into the story right away, I was a little unsure of the romance aspect and I want to see what she does with that in the next book. I still need to read this. It sounds really good. And can you believe I didn't even notice the dagger all the other times I drooled all over this cover? I mean seriously? How? Great review! I'll definitely try and get my hands on this ASAP.